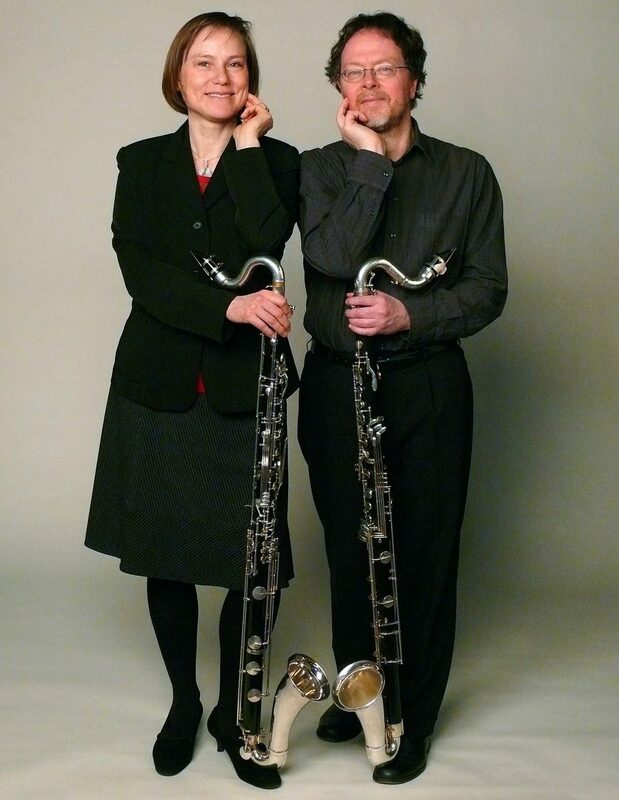 The two clarinetists Beate Zelinsky (born in Hannover, Germany) and David Smeyers (born in Detroit, U.S.A.) work together since 1980 as Das Klarinettenduo. Their concerts have taken them throughout Europe as well as North America and Japan. Their intensive work with composers representing a wide diversity of styles has resulted in almost fifty new clarinet duos and further compositions written for and premiered by them. The Klarinettenduo gave in 2005 the world premiere of Adriana Hölszky’s “On the other Side” for Soprano Saxophone, Clarinet, Accordion and large Orchestra in Berlin with the Berlin Radio Symphony Orchestra and in 2006 the first performance of her “Flugmanöver” for two clarinets and orchestra at the Donaueschingen Music Festival the duo being accompanied by the Southwest German Symphony Orchestra Baden-Baden and Freiburg. In November 2008 the Klarinettenduo premiered Nikolaus Brass’ Double Concerto “Zeit im Grund” for two clarinetists and string orchestra together with the Munich Chamber Orchestra in Weingarten, Germany. February 2009 marked the first performance of the Double Concerto “Orgoras Speaks” by the Icelandic composer Atli Ingólfsson (composition grant from the Kunststiftung NRW) together with Reykjavik’s Caput Ensemble in Cologne at the West German Radio (WDR). The Klarinettenduo has performed at many Festivals (Pro Musica Nova — Bremen, Römerbad Musiktage — Badenweiler, Rheinisches Musikfest, Romanischer Sommer — Köln, Frankfurter Feste, Wittener Tage für Neue Kammermusik, Nuova Consonanza — Rome, Weltmusiktage der IGNM, Musik‑Fest Insel Hombroich, musica viva — München, Rheingau-Musikfestival, Ultraschall — Berlin, Donaueschinger Musiktage, Weingartener Tage für Neue Musik, Musik in den Häusern der Stadt — Köln, ensembl[:E:]uropa — Köln, among others). As soloists they appeared at London’s Royal Opera House, Covent Garden as the “Swallow Clown Duo” in Karlheinz Stockhausen’s “Donnerstag aus LICHT”. Recordings of their classical and modern repertoire have been made in almost all of Germany’s radio houses in addition to many foreign stations throughout the world. They have recorded several LPs and CDs as the Klarinettenduo, together with other chamber music formations and partners including string quartet, accordion, double bass, piano, voice and also as soloists. Their recent CDs unite all of Nikolaus Brass’ chamber works for clarinets and strings on one disc (NEOS 11704) the other CD is devoted to three double concertos dedicated to the duo (NEOS 11708). Both have published articles about New Music in English and German. Their Pro Musica Nova/Studies for Playing Contemporary Music for Clarinet, published by Breitkopf & Härtel, was greeted with critical acclaim and has become a standard textbook in many of the world’s music conservatories. Beate Zelinsky taught clarinet and chamber music until 2004 at the Hochschule für Musik und Theater Rostock. Since 2003 David Smeyers is Professor für New Music Interpretation at the Hochschule für Musik und Tanz in Cologne where he launched and conducts „ensemble 20/21“. They founded the Youth Ensemble for New Music NRW and directed it from 2005 until 2008 in which function they also acted in Schleswig-Holstein from 2009 until 2010. Sought-after as teachers and coaches, they give their knowledge and experience onto the next generations in master classes in many countries (Royal Academy of Music, London; Centre Acanthes, Avignon; Hombroich: Neue Musik; Sommercampus, Rostock; Hochschule für Musik und Theater Hamburg; Musikhochschule Lübeck; Institut für Musikerziehung, Bozen; Europäische Akademie, Montepulciano).